I’ve long been fascinated with the power of habit and motivation especially when it comes to corset waist training. That includes my fascination with who makes it work to reach their figure-shaping goals, and who does not. I have students set numerical goals before they start, in inch reductions and weight reduction desired (they are two separate things and you don’t have to do both! ), and how tightly they want to wear their corset for how many hours to improve their record by the end of training. 2. Start small, maybe very small. There are only three elements to effective waist training: a regular schedule or corset wear six days a week, waist-targeted exercise (not aerobic or weight training or Crunch or any specific general program and not even at a gym), and corset-friendly eating and nutrition habits (note that I do not use the word “diet” since that is not a relevant concept today no matter if you are waist training or not in an attempt to lose inches or weight). 3. Never miss twice; re-start fast, like the next day. I advise setting only a 95% personal goal of completion of the program elements; it is impossible to hold ourselves accountable for 100% completion. That is doomed to failure from the start. Give yourself a bit of leeway to be human, to encounter daily crises that take all your time and attention, not to mention energy. However, the next day add a few more minutes to the 20 mins of waist-targeted exercises the first month (then 30 min. the second and 40 min. the third), or wear the corset two hours more than on your plan the next two days, and that sort of thing. Push yourself a wee bit to make time up, but don’t punish yourself and just quit because you have fallen off the waist-training wagon! 4. Lock in a “commitment device” such as a buddy who will show up at 6 am for that morning run and you’ll be embarrassed if you let her down (social accountability). His point is one I make when students ask me, “Will corset waist training results last?” I tend to answer, “No, if you go out the next day and start pigging out on Krispy Kreme donuts!” You know what I mean. The only thing with which I disagree, is the author’s advice to forget goals and concentrate on getting into place a system that works. I agree with that, but I think a system should be proceeded with a goal, one that is (1) reasonable, (2) do-able, (3) consistent with your lifestyle so that you are likely to pursue it, and (4) slightly under what is probable to accomplish and one that you probably will pursue to the end of your period of training. I tell my students that I would rather them set a goal slightly under what they think they want and can accomplish, so that they will more than likely reach it, and be inspired. Inspired to do what? Keep going for one thing. No one says you have to corset waist train for three months, or three weeks. You can set multiple increments of waist training, one right after the other, or one every year for a re-set and weight/measurement check, or one periodically over many years on occasions when you find yourself slipping back into bad eating habits such as portion overloading or stress and mindless eating. Inspired to do what? Celebrate! Women tend to resonate to that point more than men. Men seem to go directly for their goal then move on without taking a moment to savor victory, or during the training process to seek out others to appreciate progress and let the trainee show off. More’s the pity. Having a “rah rah” section as Marie, an awesome tight-lacer once told me, is a necessary component of successful waist training, at least for her. Having someone appreciate and celebrate your effort as well as your successes along the way, can inspire you to continue to take better care of yourself after training ends. It’s all pretty simple. Now what will start you moving forward in your New Year’s Resolutions that about 80% of us break by the end of January every year? A principle applicable to any goal of changing a habit, size, or shape (including one’s waist measurement or weight), is that of “finding the right teacher at the right time.” I’ve concluded that no matter how efficacious a particular approach, therapy, “hack,” or training regime is, one won’t get the most out of it unless one trusts and respects one’s teacher or trainer. Also, one has to research and choose the best approach that works on an individual basis. Which doesn’t mean that one should not pursue the more esoteric of therapies and approaches, those with only anecdotal evidence of effectiveness. With a proper mindset, an attitude of flexibility and hope, common sense, an evident rationality behind the theory, and a moderate method, plus the right teacher found at the right time, corset waist training can work for many, and remain permanent–if and only if one does not end the program and then start pigging out (again?) on Krispy Kremes! I’ve been a fan of the Alexander Technique for several years now, and understand a lot more about how it works after my many classes and more reading in the field. Recently I asked my teacher, Elyse Sharfarman (bodyproject.us) to summarize the differences between that technique to relieve stress and calm the body and mind, with Feldenkrais, another alternative mind-body therapy. A chronic pain program director at Kaiser recently suggested to me that because Feldenkrais was offered in her program to Kaiser members, and because the goals were the same as for the Alexander Technique (light, efficient movement), that was a sufficient option for patients. The implication at least to me, was that the two therapies or techniques were interchangeable. With Elyse’s crystal-clear explanation of the differences set forth in this blog below, I remain convinced that they are substantially different in method, and that anyone interested in pursuing alternative therapies for better health and stress reduction (including stress eating and portion overload that contribute to a plump figure and certain health risks), should check out both the Alexander Technique and Feldenkrais, and then find a compatible, qualified teacher of the technique chosen–or try both! Personally, I found the right teacher in Elyse, who has 10 yrs. of teaching experience at the San Francisco American Conservatory Theater plus many more years of study with a well respected teacher Frank Ottiwell, and proper certifications in the technique. Plus she has none of the “attitude” demonstrated by some teachers of the more esoteric mind-body therapies; for Elyse it is not form over substance. Plus she focuses her work on her individual patient’s needs and progress, pulling from her ballroom and modern dance experience/classes, and master’s degree studies in Physiological Psychology. In her classes I first learned the unique concept of delaying movement (called “inhibition” by F.M. Alexander) so that I noticed what I was doing to habitually over-use and stress muscles (sometimes with improper posture). If I did not first stop and notice what I was doing, then I could not choose to change and saw no reason to do so–a simple but profound lesson! I also learned the concept of self-direction that I easily employ while going about my daily business. Specific mental reminders help me notice and release unnecessary muscle use and strain as I move (walk, stand, sit, read, watch tv, work on the computer, paint picture, etc. ), strain that can easily creep back into my body; no specific exercise is required of me. More importantly, I once and for all learned how it feels in my entire body (brain down to toes) to totally relax every single muscle and finally feel safe and pain free, through “constructive rest” in a supine position. I can only describe this new feeling when supine as being completely flat like a pancake, or being at complete “oneness” during table work with Elyse, and later when I practice at home. By now I can easily duplicate the feeling/thoughts either lying down or standing up and when I want, in order to stop in its tracks any impending muscle tension and stress. The Alexander Technique has become my “biofeedback with a brain” program, and has had the amazing result of improving some of my interpersonal relationship skills as well. I am less likely to jump to conclusions or be critical of others these days, and that is a good thing! In sum, I believe that this technique provided the final key I was missing to restore me fully to my former sense of well-being, ability, and delight in being alive, after a disabling back/neck spasm triggered in the summer of 2016. Physical therapy exercises given to me by Kaiser’s PT (and followed faithfully each day to a “T” for over a year), plus three-days-a-week-swimming and another three days of walking and back/neck exercises that I continue to this day–useful as they both are and continue to be–were simply not enough to finally cure me of pain. Of relevance to the Alexander Technique is that there now exist an increasing number of significant, randomized control trials (not just anecdotal evidence) of the effectiveness of the technique on various health matters including chronic back pain; see, e.g., published research on the technique: https://www.amsatonline.org/aws/AMSAT/pt/sp/research and the best study to date: https://www.bmj.com/content/337/bmj.a884. *“Feldenkrais studied briefly with F. M. Alexander, then developed his own method which is also influenced by Judo and physics. The method does not address the habitual way that people move in their everyday life, nor does it teach them how to change this. The assumption (of Feldenkrais) is that by doing exercises (which can be profound), you will move differently automatically. I don’t know if this is true, given that all the triggers for poor movement (stress, bad chairs, hurrying) persist even if you are temporarily moving better as a result of a Feldenkrais lesson. The Alexander Technique teaches you how to change your response to all those triggers for poor movement and pain. Through the Alexander Technique you learn how to use your mind (thinking) to change habits of movement while sitting, standing, driving, walking, etc. In this way, Alexander Technique is much more practical because you don’t need to lie down and do an exercise to practice it. You can improve movement in your daily life by simply thinking, no matter how emotionally stressful your day is, or even with initially poorly-designed posture or movements. As one certified Alexander Technique teacher once told me when I was deciding what to pursue, the technique is “a thinking person’s PT.” Now I know it to be true! “…. researchers found that higher levels of fitness were associated with a smaller waist circumference and a lower degree of inflammation independently of BMI. The researchers acknowledge that there are possible limitations that may affect the findings of the study, but overall the results suggest that increased fitness has the potential to reduce abdominal fat mass and inflammation which may improve metabolic health irrespective of BMI. What’s interesting to me, is that this finding is independent of the BMI, recently reported by our so-called president’s doctor, after examining our 237-lb leader. Apparently this doc left his tape measure at home and ignored the waistline. Just one more bit of proof that corset waist training is addressing a truly significant health indicator of risk to health and life! And it’s a heckofa lot more fun than going on (yet another) diet! The absence of tape measures is not unusual. Most doctors never measure our waistlines! I’ve read that before, and I personally know that to be true. What is wrong with doctors today, and medical schools that fail to teach med students to keep a tape measure in their office desk, or better–draped around their shoulders like the stethoscope we always see? Trying New Things is Easy — on January 1, but afterwards???? Trying new things—usually a diet of some kind—is easy on January 1. Maybe on January 2 it’s easy to start one or go to the gym, or even do so thru the end of the month. But sticking to it? That’s another matter. Yet it’s first things first, we say. And that is just to try. But trying new things is “so hard to do” says New York Times article writer Sendhil Mullainathan in the Business Section of the Dec. 3 issue. This applies to countless folks who have emailed me over the years that I’ve been advising, coaching or writing about corset waist training (some 15-plus years by now, since I first coached a student in our three-month process of shaving inches off the waistline and losing pounds, if the latter is also desired as a goal. 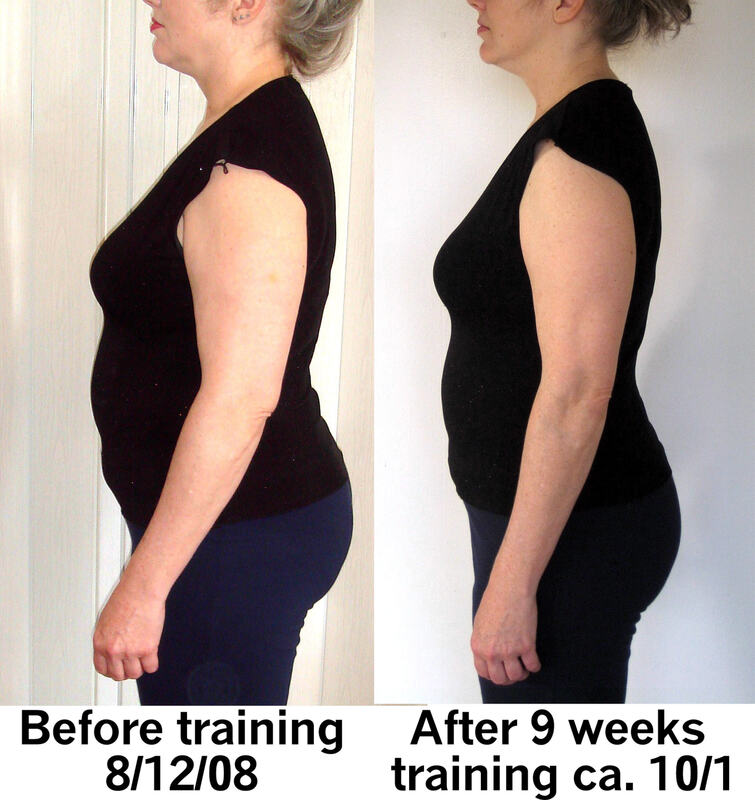 Our latest student, Ms. K, is shown here after coaching, with amazing improvement of posture even with moderate weight and inch-loss!). The great majority of those inquiring about or expressing interest in the process, do not follow thru to enroll in my program or buy my book (the 2016 version is only $14.95 for a full-length, detailed “how to” book), or they never contact me after I answer their initial questions and provide encouragement. Thus, I never really know if they move forward based on some other source of information or on their own. Most likely most do not move forward at all to try the process. Mullainathan posits some five or six reasons we hesitate to try something new: habits are powerful, he says, to start with! Then, trying something new can be painful (you might not like the process or the results), you have to forgo something to try something new, the cost is immediate while the benefits are remote at a future time that feels abstract, we are overconfident in our negative assessment of the cost and potential benefits, and we engage in automatic behavior doing the same thing we have always done and making the same comfortable choices. There is simply an “automatic bias in favor of the status quo” Mullainanthan concludes. January 1 provides us with the impetus to once more try to overturn our status quo. That’s true for this coming New Year of 2018, as it has been in all the other new years of our past. Why not take the chance this New Year to try something new?– if you have been curious about corset waist training but not yet dipped your toe in the pond? Just contact us (inquiry@romantasy.com or call 415 587-3863) and I’ll happily chat with you about how others have gone about the process, what my students have found difficult or easy, and the results they experienced. Even better, you can view amazing moving gifs such as this one of full-figure student Ashlee, or this one of of transwoman client Amy, accurate images as far as Raven, my web assistant, can make them. The images show “before” and “after” three-months of coaching, with substantial to dramatic posture and figure changes. Or just visit our waist training pages, the page showing results of those who generally follow the program I recommend, as well as results for those who have formally trained in our coaching program. I once had a person reply to my general announcement about availability of the ROMANTASY coaching program, to the effect of “why do I need your coaching program–or anyone’s help for a fee–when I can simply go on social media groups and get all the information I need?” It’s a valid question in one aspect; perhaps you don’t! There is a lot of free information out there these days about how to waist train and you might be the type who is self-motivated and determined to reach your goals. But–are your goals reasonable? And what happens when you hit a bump in the road and there’s no individualized, medically-sound or verifiable answer to be found? As in the past, the amount of information out there on the web and in chat rooms does not one-to-one translate to accurate information or helpful information for you! One is tempted to mention the old saying of “the halt leading the blind.” Sometimes that can be true, and more often than you might think. There are nuances to waist training; everyone is individual in their response to waist training, and no single piece of advice or formula works for all. A qualified coach can listen to your individual concerns, discomforts, and physical and emotional challenges, think about prior long experience in the field, and help you figure out how to best deal with them so you can reach your goal without giving up midstream. An experienced coach has other resources to consult regarding specific questions you may have (we have two doctors on call) and can offer you additional help as we do, such as assigning a former successful student to be an additional peer coach during your training program. These resources beyond what your coach can offer, can be valuable to provide other perspectives as you move forward. “Experimentation is an act of humility, an acknowledgement that there is simply no way of knowing without trying something different” says the New York Times writer. 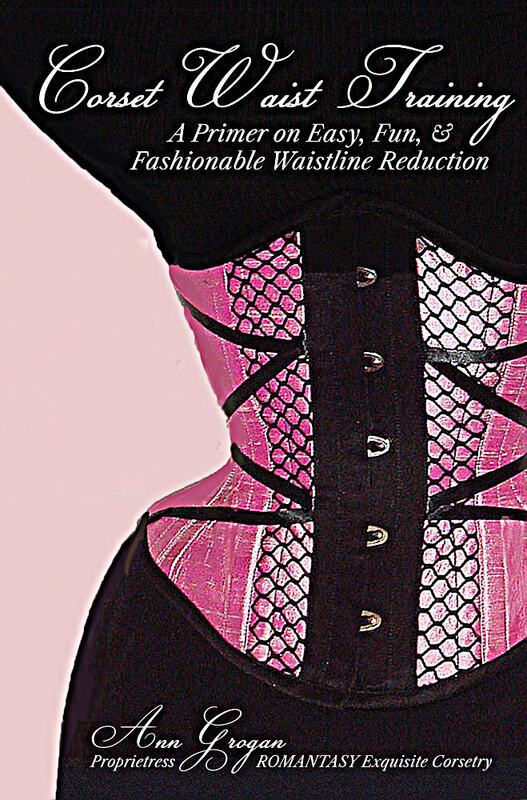 Why not experiment with corset waist training in the New Year? It’s fun, it’s fashionable, and it’s amazingly successful if you set reasonable goals and are dedicated to a moderate health-conscious process for a short period of months. Then maintaining your success is another matter for another blog, and another book that I’m working on. More on that challenge for later! I’ve always supported the notion that curvy women look better in corsets and “take to” them easier than do slender folks. ROMANTASY features a full-figure gallery to encourage women of all sizes and shape to try a corset for any of a number of purposes. 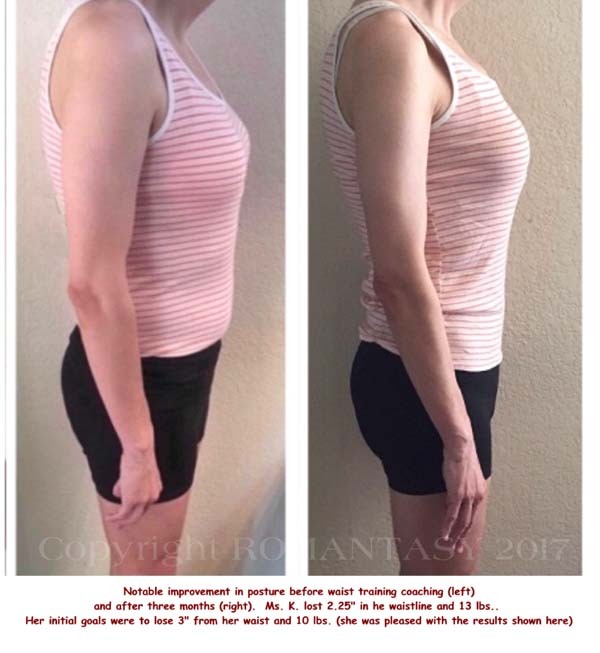 One of our clients pictured on that page had a bosom measurement of 54″ and a waistline measurement of up to 60″ is not all that abnormal over our 27 years in this corset business. 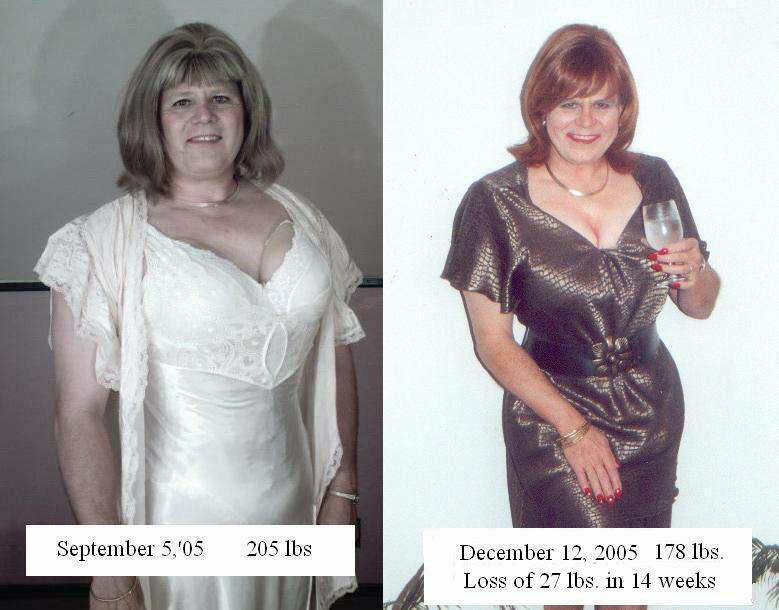 Here are a few of my favorite pictures of the vast majority of my typical corset clients over the years. Marcia Venema (holding flowers), is one of our most loving supporters of all things corset and of my modest small business venture, with an amazing 16″ natural hip spring (waist vs hips). (Black and white, and magenta corset by Sue Nice, former team member; blue and brown corsets by Sheri; ). In general, I agree with the body acceptance trend, but honestly, I have always had a vaguely discomfiting feeling that I have not been able to name, when it comes to that term, in conjunction wtih how to think about large waist sizes and weight. To me, the bottom line is that we each have to judge our own body size and shape as to whether we feel good and safe in them, healthy, and out of pain. But I continue to wonder if obesity is ever a good thing to support in the name of body acceptance? As for Mirren as Allure’s Sept. Cover Woman (let’s dump forever the term “girl” as Mirren is surely not that! ), one can only muse, “why now, and why not eons ago?” Betty Friedan mused along with me in 2006, but not eons ago, when she published a book I recommend to all, The Fountain of Age. Aging is not a trip to the garbage heap according to Friedan. But there’s a lot more research to be done with attention to men and women over 70, to fill in a huge gap in knowledge as Friedan points out. And of course, there is a lot more research to be done on weight, waist size, hunger, eating habits, nutrition, and related health matters. Lately The European Heart Journal reported on a new study from London designed to find a correlation between people who were fat but fit, and heart disease. 521.000 Europeans from 10 countries participated and were monitored for 15 years. It’s worth a read if like me, you are struggling with the concept of body image and how that relates to overall health and health risks. The researchers noted individuals as being “unhealthy” if they were found to have at least three harmful metabolic markers such as high blood pressure, high blood sugar levels, and a larger waist size (37″ for men and 31″ for women). Meanwhile, those with a body mass index (BMI) of over 30 were considered “obese,” while participants with a BMI of 25-30 were viewed as overweight. Anyone with a BMI of 18.5-25 was listed as normal. While participants who made the “unhealthy” list were more than twice as likely to suffer from coronary heart disease regardless of weight, people considered “healthy” under the formula who were overweight still had a 26 percent greater risk of battling the condition. Obese “healthy” participants were found to have a 28 percent increase risk. More than 10,000 people served as a control group for the study and factors such as exercise level, smoking history, and socio-economic status were taken into account for the research. The authors believe that “the excess weight itself may not be increasing the risk of heart disease directly, but rather indirectly through mechanisms such as increased blood pressure and high glucose.” They agree that stronger awareness and prevention measures, along with treatment of obesity, be offered by doctors so that those who “fat, but fit” don’t lose sight of losing weight. I’ll let that be the last word for now, but always welcome your thoughts on the matter! I’ve always been one to speak up about policies and procedures that make no sense, or about something that I feel will improve my family, community or personal life. That also includes corsets. Some who first considering wearing a corset, equate them with being from the fringe or the fetish world. Some see only the sexual aspect of corseting, not realizing that corsets are worn for a countless number of distinct, beneficial reasons (See corset enthusiast/corset maker Lucy William’s book, Solaced, available on amazon.com). Some fear that being identified with corsets by letter writing, or by wearing the corset as an outer fashion garment, or even by stealthing and being outed in some way, will bring opprobrium down on their head. They don’t see sufficient benefit of posting public comments or writing letters to editors or to authors of articles to correct wrong statements about corsets, to provide personal examples of positive benefits, or to make comments on style, design, and construction. I wonder how truly harmful those comments would be, really, or even if they would hear any at all? Most folks are into their own things and go about their business with little regard for others who might be tangential. Perhaps we succumb to imagined trauma when there is none these days? Corsets are worn visibly and are ubiquitous outside of a fetish content. With nearly 400 international corset makers showing their wares on the web and rushing out gorgeous custom creations to hundreds if not thousands of clients all over the world? A rather new BFF of mine is subject to the connection of wearing corsets with both delight, and with shame. Recently she picked up a stunning, comfy and well fitting new overbust corset by Sheri (pictured here with lavendar paisley corset fitting properly; note there is no “toothpaste” protruding underneathe her arms; nor in the back which is not pictured) who is now our preferred ROMANTASY CORSETIERE (send us email for a direct referral to work with Sheri on your design and style needs). Her daughter questioned the height of her mom’s bosom in the corset. Of course the corset needs some seasoning to fit better over time, and it needs to be pulled a bit down on my friend’s body (with the lean-pull technique). As another example, the client, not my new friend, pictured here is wearing a red Chinese polysilk underbust style corset too high on her torso, allowing her lower stomach to protrude outward. She pulled the corset down about one inch and lo! it fit perfectly! My BFF needs to remember that a corset tends to rise when sitting for a while, and over a day of wearing. Wearing a corset takes some attention and some tinkering with height and lacing down; the best fit requires some adjustment during the day until the corset settles on the body. Of course, we’re so used to seeing ourselves slump under loose clothing styles, that just seeing better posture looking back in the mirror can be stunning, even shocking, and take some getting used to. Most of all, my newly-corseting friend needs to heed my advice to delay any negative — or positive ultimate conclusion if corsets are for her or not. Aside from potential negative or ill-informed comments that need to be corrected when they occur in the media, often corsets in the news are simply left out in any discussion about health or body size or shape, or about fat, obesity, and diet challenges. That’s true of one New York Times Magazine’s article from this past Sunday (see below). It’s as if corsets and corset waist training just don’t exist, much like society has treated women as not existing in conversations conducted and dominated by men in the boardroom and conference hall. Women have to push their way in and speak up to be heard; it takes courage. Courage is more important than courtesy, as Senator Kamala Harris believes (she’s publishing a button with that saying, and I’m waiting for mine to wear proudly). I urge you to consider pushing your way into any misguided corset conversation, or where your informed comment may be relevant, so that these wonderful garments and their many benefits become more broadly available in the consciousness of anyone who wants to improve their posture and/or lose weight or waistline inches. It’s one more option of self-improvement that has nothing to do with dieting and everything to do with feeling good, fashionable, feminine, comfy, and au courant!! We need every voice to speak up to address “The Corset Question” and diminish it’s ludicrousness and invented foundational belief that corsets cause pain. On another point, one person reminded me to confront statements like I used to make, that modern day corsetry well fit and custom, is a lot more comfy than Victorian corsets were. But that’s simply not true — or women would have been complaining and not wearing them a long time ago! Any custom corset properly fit, then slowly seasoned and worn properly on the torso and with respect to the body’s messages about comfort and health, can be beneficial, and almost never detrimental to health and well being if common sense is applied in the wearing. If you want to know how to safely and sanely waist train, check out what a doctor, nutritionist, and corsetmaker say about my new “how to waist train” primer book (just $14.95 online). It can help ease your way into comfy waist training, and avoid most pesky problems that might occur for some.